Remote sensing, affordable and on demand, using drones. Remote sensing with drone technologies provides an important tool to aid site-specific management of crops. Drone sensing has the potential to provide real-time analysis of the attributes of a growing crop that can assist the grower in making timely management decisions directly affecting the outcome of the current crop. Analyzing fields and crops is similar to analysis performed by satellite imagery. However, using drones has makes the information cheaper and more accessible and can provide results in hours not weeks. Several types of analysis are listed below. NDVI results show red as stress areas of crop. Crop scouting with drone imagery makes it possible to measure plant health and identify crop stress. Plant health algorithms, such as NDVI,compare the proportions of light captured across different bands (red, green, blue. infrared and near-infrared) to compute numerical values for each pixel or area of a given drone map. Using a drone, we can capture highly accurate images of your fields, an average of approximately 100 acres and hour, without the cost and hassle of manned flight services. At a far greater resolution than satellite imagery provides, even when there is cloud cover. 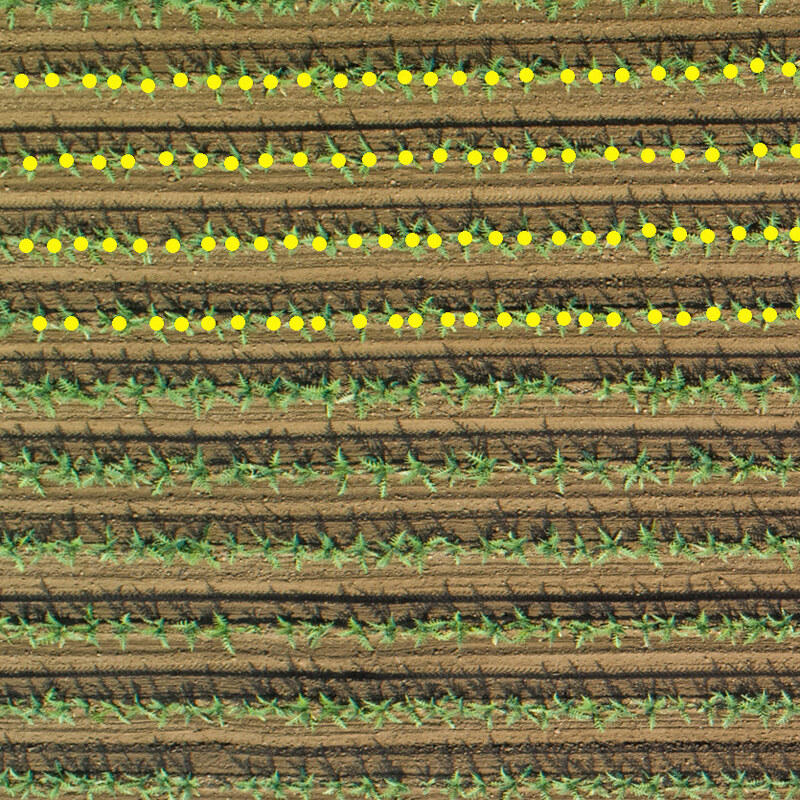 Drone flights performed as crops begin to emerge can give you a visual index to locate gaps and monitor fill in while still early in the growing process. In addition, actual stand counts are now possible. Using drone imagery automated through post-processing software, actual stand counts are now achievable. Eliminate estimating and field variability by obtaining counts based on full field density. Multispectral image show crop stress in red, health in green. Traditionally, early detection of an invasive pest requires a great amount of luck and sweat. Until now, a grower or a pest specialist has to make an educated guess about where to go in a large field to check for infested plants. It works, but if its necessary to check hundreds to thousands of acres, it's not very time effective. Whereas with remote sensing using drones, you can scan a wide area in a short amount of time. Similarly, regular flights over fields can illustrate spraying problems either before or after an application. Using GPS flight data from the drone, areas can be GPS located for respray. Crops can be evaluated as a standard RGB image and using various multispectral analysis. Both can assist in determine the optimal harvest opportunity. Aerial images revealing irrigation patterns. Flights before planting or before crops break ground can be helpful in assessing soil differences, weed pressure, drainage issues, and general crop planning. In general, even before planting, drone flights and analysis can help optimize a plot. Achieving accurate and detailed crop analysis requires specialized sensors to do the job right. We fly the MicaSense RedEdge, an advanced, lightweight, multispectral camera. The RedEdge provides accurate narrow multi-band data for agricultural remote sensing applications.